Various game components will be left over and need to be distributed to the players. What each player receives and how it should be arranged is shown on the next page. Place the game board in the middle of the table. Put the 50/100 point cards next to the 50 space on the score track. Shuffle the 18 Goal cards and place them in a facedown pile next to the board. Place the money (40 coins including 1s, 5s, and 10s) in a general supply next to the board. Place the goods (gold, pepper, silk) and camels in a general supply next to the board. The larger pieces count as three of the smaller ones. The supply of goods and camels is not limited. In the rare event that the supply runs out, use something else as a substitute. Place the 6 City Bonus markers on the board spaces whose letters correspond to those on the tiles. Shuffle the 10 outpost bonuses facedown. Place one outpost bonus, faceup, onto each large city on the board. Return the 3 unused bonuses to the game box. Shuffle the 31 City cards facedown. Place one card, face up, onto each of the 9 City card spaces on the board. Return the remaining city cards to the game box. They are not needed for the game. Set the 6 starting contracts to the side for now. Shuffle the remaining contracts facedown and form 5 piles, each with 6 contracts. You will have 8 left over. Take one of the piles and place one contract, faceup, onto each contract space on the board. Place the remaining 4 piles next to the board. Take the remaining 8 contracts and form a special pile. Put this pile next to the board as well, somewhat removed from the others. Place the 10 Character tiles, faceup, next to the board. Some characters have special extras: leave the 2 black trading posts, the white die, and one figure in each color in the box for now. A summary of the different characters may be found on the supplement. Place the 5 black dice onto the board, on the space showing a black die. The die values don't matter. The player who most recently embarked on a voyage around the world is the start player. Give that player the hourglass. Each player chooses a color. Take the corresponding player board and place it in front of yourself. Take the 5 dice in your color and put them onto the marked dice space in the upper right corner of your board. Take the 9 trading posts in your color and put them onto the marked spaces in the upper left corner of your board. Each player now receives a contract. Use the starting contracts previously set aside. Each player chooses one facedown contract, placing it faceup onto one of the two active contract spaces on their player boards. 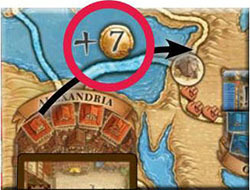 For your first game, you will need the following 4 characters: Give the starting player Rashid ad-Din Sinan, the second player (in clockwise order) Matteo Polo, the third player Berke Khan, and the fourth player Mercator ex Tabriz. Once you are familiar with the game you can pick your characters. Give each player 2 figures in their color. Place one onto the 50-point space of the score track, and the other onto Venezia. Deal each player 2 facedown cards from the Goal card pile. Players should keep their Goal cards secret. Once you are familiar with the game you can pick your Goal cards. The Goal cards are presented in the supplement. Finally, give each player a player aid. The game can now begin. 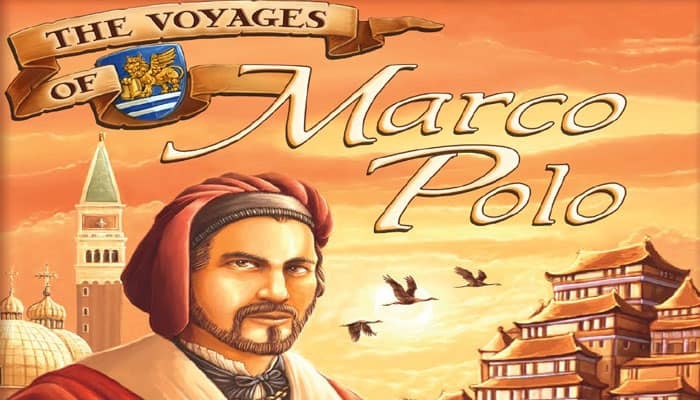 Players play as associates of Marco Polo, who traveled with him and in the surrounding areas. Each player tries to collect points by completing contracts and visiting as many lucrative cities as possible. Completed contracts provide more than just victory points, they also offer discounts and the ability to use privileges in the cities you visit. On top of that, they let you reach goals for the end of the game. At the end of the game, the winner is the player with the most victory points. Play proceeds in clockwise order, with each player acting in turn. Players roll their dice and use them to occupy action spaces on the board. Players keep taking turns until all of the dice have been used, at which point the round ends. The game lasts a total of 5 rounds, and then ends after a short final scoring. A detailed summary of a game round has been provided at the end of the rules on page 16. For now, we will start with a single game turn and then continue with the actions. A turn in this game means choosing at least 1 die from your player board and placing it onto the action space of your choice. You can add your dice to an unoccupied brown or blue action space, or to an already occupied blue action space. You then immediately perform the corresponding action. You can also perform 1 or more bonus actions, either before or after your regular action. This is always up to you. As long as you have dice left, you must choose and perform exactly 1 action. Once you are out of dice, you pass automatically. You will not have any more turns this round! Once you have taken your turn, the next player in clockwise order takes a turn. Players keep taking turns until all of their dice have been placed. This ends the round. Next, we will take a look at the game board, followed by the individual actions. The various regions and their associated actions. The following 6 actions are possible: Take 5 coins, go to the bazaar, seek the Khan's favor, take a contract, travel, and City card actions. The bonus actions are: Complete 1 contract, take 3 coins, reroll 1 die, adjust 1 die result by 1, and take 1 black die. We will now explain the various regions and their associated actions. You can only use your own dice, never those of the other players. You must use as many dice as are shown on the action space you want to use. You can place your dice on unoccupied brown or blue spaces, or occupied blue spaces. For the time being, we will assume that the action space is always unoccupied. If you want to use an occupied blue action space, then you must pay coins. If a brown action space is already occupied, you are not allowed to use it. Each player color (blue, yellow, green, red) can only be used once on each action space. After you have placed your dice, you immediately perform the corresponding action. The dice themselves indicate how many times you can perform the action, or how much the action gets you(exception: Take 5 coins). Apart from a few exceptions, this is always the lowest die. If you are allowed to perform an action out multiple times or get more from the action, you can always choose to perform the action out fewer times or get less. You must always perform the action at least once. Important: How exactly is an action carried out? Pay the necessary coins, if any. To take 5 coins, you must add exactly 1 die to the "Take 5 coins" action space. The die value you use is irrelevant and does not affect the action. You always take 5 coins. If the space is occupied, you must first pay to place your die (see page 13) before performing the action. Example: Yellow places a 3-value die onto the "Take 5 coins" action space. She takes 5 coins from the general supply. Above all else, you will need goods to complete contracts. Additionally, you can use certain City cards, located in the larger cities, to trade goods in for coins, camels, or points. Goods may also bring you points during final scoring. Place Your Dice On 1 Of The 4 Distinct Action Spaces. You must use as many dice as indicated by the action space you are using. Example: Blue places 2 dice (a 4 and a 5) onto the "silk" action space. Determine How Many Goods You Receive. To the right of the action spaces is a table indicating how many goods a player receives. The value of the lowest numbered die used to perform the action determines how many goods you will receive. The lowest die value Blue used is a 4 , which means that he can take 3 silk from the supply. Take The Goods And Add Them To Your Player Board. Take the goods from the general supply and place them in your player board's warehouse. Blue takes 3 silk from the general supply and adds them to his warehouse. You can also choose to use a value lower than your lowest die value. This usually only makes sense when this gives you some variety in what you receive. Example: Red places a single 4-value die onto the "Pepper" action space. She could take 3 pepper from the general supply. She could also, however, choose to use a lower number and take 2 pepper and a coin. Take as many camels from the general supply as indicated by your die's value. Add the camels to your warehouse. /Example: Green places a 6 onto the "Camels" action space. He can take up to 6 camels. Green takes the 6 camels from the general supply and adds them to his warehouse. Note : There is not much point in using a lower value when taking camels. The Khan's favor is another way to get the goods. Place exactly 1 die onto the « Khan's Favor » action space. Then take 1 good of your choice and 2 camels from the general supply, adding them to your warehouse. The first player to seek the Khan's favor places her die onto the left-most die-space and claims her reward. The next player who wishes to use this action must place his die on the next die-space over. The next die to be used must have a value equal to or greater than the previously-placed die, or the action may not be used. These same rules are in effect for the remaining players. Example: Green places a 3 on the first "Khan's Favor" action space. He takes 1 gold and 2 camels from the supply. Red places a 4 on the next "Khan's Favor" action space. She also takes 1 gold (but could have chosen something different) and 2 camels from the supply. Note : There are only 4 distinct spaces in this action space. When those 4 spaces are occupied, it is no longer possible to choose this action for the rest of the round. Each player color can only be used once on this action space. They are reason we go to the bazaar. To take contracts, you must place exactly 1 die onto the "Contracts" action space. You can then take 1 or 2 contracts from the contract spaces on the board, placing them onto the spaces for active contracts on your player board. The value of the die you use here determines the contract(s) you may choose from. /Example: Blue places one of his dice (a 3) onto the "Contracts" action space. Blue takes 1 or 2 contracts and adds them to his player board. If you take the contract below the 5, you also receive an additional 1 coin or 1 camel from the general supply. If you take the contract below the 6, you receive 2 coins or 2 camels. What Else Needs To Be Observed? Immediately after taking your contracts, slide the remaining ones on the board to the left, filling in any gaps left from the contracts you took. There should never be empty spaces between contracts. As soon as you have taken your contracts, slide all remaining contracts to the left. If there is only 1 contract on the contract spaces, you can only take that one during your turn. If all contract spaces are empty at the beginning of your turn (before you take any action), draw two contracts from the special contracts pile and place them beneath contract spaces 1 and 2. There is room on your player board for 2 contracts. When you take new contracts, you must also have room for them - or you will need to make some. If you do not have enough space, you must discard one or both of your 'older' contracts first, adding them to the bottom of the special contract pile. Example: Green takes 1 contract from the board. He has no empty space on his player board. He chooses to discard one of his 'older' contracts, adding it to the bottom of the special pile. He then places his new contract on his player board. These are only relevant in special cases and can be reviewed in detail later. You are not allowed to take contracts from the board and add them directly to the special pile. New contracts must always be added to your player board first. As long as your contracts are on your active contract spaces, they are not worth anything. You must first complete them. Moving your figure around the map. Place exactly 2 dice onto the "Travel" action space. This allows you to move your figure around the map. The steps involved in moving your figure are outlined below. /Example: Red places 2 dice onto the action space. How Exactly Do You Move? The value of the lowest numbered die used to perform the action determines how many spaces you can move. Note : You can always choose to move fewer spaces but you must move at least 1 space. /Example: Red places a 2 and a 4 onto the action space. She can therefore move up to 2 spaces on the map, as the lowest die value is a 2. Each "Travel" action spaces shows the costs for movement. This means that you must always pay for your movement. You only pay for the spaces you actually moved. Return your payment to the general supply. /Example: Red wants to move 2 spaces on the map. This will cost her 7 coins. Red returns the necessary coins to the general supply. Many of the routes connecting two locations show additional costs, either camels or coins. In these cases, you must additionally pay those costs for your movement, returning the necessary camels or coins to the general supply. To use this route, you must take 2 camels from your warehouse, returning them to the general supply. To use this route, you must pay 7 coins, returning them to the general supply. Move Your Figure And Possibly Place A Trading Post. If your "Travel" action ends in a large city, then you must place a trading post there. From your next turn on, you can use a die to activate the City card located there. The card itself remains in the city. If your "Travel" ends in an oasis, nothing happens. Oases have no function other than slowing down travel. Example: Red places one of her trading posts in the small city. Red immediately receives the city bonus, in this case 1 camel and 3 coins. When placing trading posts, start with the one in the upper left corner of your player board and continue working your way down and to the right. Once you place your 8th trading post, you immediately receive 5 victory points , which are immediately scored on the score track. Once you place your 9th trading post, you immediately score another 10 victory points . If you end your movement in Beijing, you place a trading post in the city as usual. Place it on the empty space showing the largest number of victory points. You will score these points at the end of the game. Moving back and forth is allowed. This means that you can pass through or end your movement on the same location multiple times. Note: You may never have more than 1 trading post in any large or small city. You may not place another trading post, even when visiting a city for the second time. The first player to place a trading post in a large city receives the outpost bonus for that city. Take the indicated bonus from the general supply and add it your holdings. Return the outpost bonus tile to the game box, it is no longer needed for the rest of the game. At the start of the game, all players start in Venice. It can occur during play that you move your figure back to Venice. If this happens, you do not place a trading post there. Once you have placed all of your trading posts onto the board, the next time you must place a trading post, you must instead move an existing trading post from one location to the other. Each large city on the board has 1 City card in it. To use a City card, you must have a trading post in the corresponding city. You must then place exactly 1 die onto the City card's action space to be able to perform the action. The individual city actions are summarized in the supplement. Yellow has a trading post in Alexandria. She can place a die on the card and use the action. Note: City cards can only be used once per round. Once a player has occupied a City card space with a die, then no one else may use the action until the start of the next round. Note: In most cases, the value of the die you use determines the number of times you may use these actions. As long as it is your turn, you can choose to perform one or more bonus actions before or after your main action. What bonus actions are available? On the left side of each contract you will see the required camels and goods. On the right side of each contract you will see the rewards you get when you complete the contract. An explanation of the symbols can be found on the supplement. You can only complete contracts on the active contract spaces of your player board. To complete a contract, you must have the necessary goods and camels in your warehouse. Pay all of the necessary goods and camels, returning them to the general supply. Receive all of the rewards indicated on the right side. These rewards are always a combination of victory points and something else. The symbols are explained on the supplement. Finally, put the completed contract facedown into your drawer, in the bottom right corner of your player board. This space has no cost, whether it is occupied or not. The die value used when performing this action does not matter. Regardless of the number on the die you place there, you always take 3 coins. As long as you have any dice left, you can continue to choose to perform the "Take 3 coins" bonus action. Note: It is possible to place your last die on this action space, even if this is not a main action. You can pay 1 camel to reroll 1 of your dice once. You can pay 2 camels to adjust one of your die results up or down by 1. +Note: You may not adjust a 6 to a 1 or vice versa. You can pay 3 camels to take 1 black die from the general supply. Roll it immediately and add it to the remaining dice on your player board. The black dice are limited. However, all black dice are returned to the board at the end of each round. Consequently, players will have a chance to get more black dice during the following round. Note: Each player can only take 1 black die per turn with this bonus action. A player may realize a single bonus action multiple times during his turn (exception: take 1 black die). However, the cost must be paid each time. For example, if a player wants to adjust 1 die twice, he would have to pay 4 camels. You can only perform bonus actions before or after your main action. If a player has black and/or white dice, he may reroll and/or adjust them. There are a few other things to remember. These are explained below. When you want to use an already-occupied action space, you must pay for it. You must pay as many coins as the die value of the lowest-value die you are using to perform the action. This is independent of any dice already present on the action space. The die values of other players' dice do not matter. Once you have paid, then you can perform the action as usual. /Example: There are already 2 Blue dice on the "Silk" action space. Red would like to buy some silk as well this round. Red places 2 dice (4 and 5) onto the action space. Red pays 4 coins (as her lowest die value was a 4). She then takes up to 3 silk and adds them to her warehouse. When a player wishes to place dice on an occupied space, stack them one on top of the other. This will make it easier to see who is the last player to have chosen that action. If need be (too many dice), place them next to one another, from left to right. The one to the right will now be the last one to have chosen this action. Exception: The Khan's Favor, seen on page 7, only offers four action spaces. When those four spaces are occupied, it is no longer possible to choose this action for the rest of the round. White and black dice are not considered player colors (blue, yellow, green, red). As such, a player with those types of dice could reuse an action space they have already used with their player color. A player may combine black and white dice with dice of their color. However, your color dice may never be more than once on the same action space (exception : Take 3 coins). Note: There is no limit to how many white or black dice can be on an action space. /Example: Green has already taken camels this round. He cannot use his Green dice to take any more camels this round. He has a black die left, though, which he can use to take more camels if he wishes. If the sum total of all of your dice at the start of a round is less than 15, then you receive compensation in the form of coins or camels. You can take 1 coin or 1 camel for each point of difference between your total and 15. You are allowed to take a combination of both should you be able to take more than 1. Example: Green has rolled a total of 13. He has 2 points of compensation: 2 camels, 2 coins, or 1 camel and 1 coin. The game is over after 5 rounds. You can tell how many rounds are left by how many contract piles are left. The final round of the game happens after the last pile of contracts is added to the board. Final scoring occurs after the final round. Each player scores the points for their 2 Goal cards. Goal cards are described in the supplement. Score 1 victory point for every 10 coins you have left. If you have a trading post in Beijing you score the victory points ( ) indicated by the space your trading post is on. If you have a trading post in Beijing, you score 1 victory point for every 2 goods you have left. 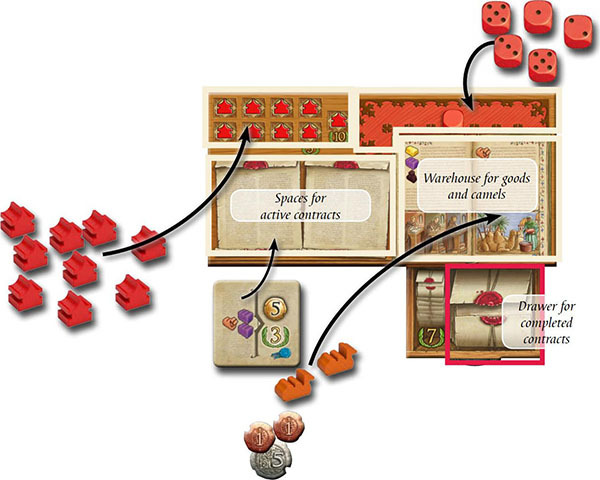 Players without a trading post in Beijing score nothing for their remaining goods. Important: Camels are not goods! The player(s) with the most completed contracts score 7 victory points. If there is a tie, then the winner is the tied player with the most camels. If there is still a tie, then there are multiple winners.